Looking for a new CrossFit family in Gilbert? You won’t find a better box than CrossFit Preferred. We’ve got everything you need to take your CrossFitting to new heights here in the desert, including all the CrossFit tools you know and love (and sometimes love to hate), specialty classes, and FREE childcare. Come try us out and see what you think! Come on in for your FREE intro session and see why you’re going to love training at CrossFit Preferred. See our facility, meet our members, chat with our coaches, and find out for yourself what a real fitness family is all about. Simply fill out the form and someone from our team will contact you shortly to discuss the best time for you to come in. 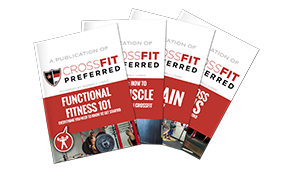 We are also happy to help answer any questions you might have about training at CrossFit Preferred. We look forward to meeting you!